Our coffee machine was broken down this week and had to go in for a service. This took a couple of days, so we needed an instant coffee to fill the gap. Nothing happens in this house without coffee! Haha. This was super convenient, and tasted good with none of the bitter aftertaste a lot of instant coffees have. Maybe that’s the cinnamon helping to cover it, I’m not sure. The fact it has a creamer mixed in means it doesn’t require milk if you don’t want it. I added a splash of Hilo to cool it down. Would happily buy this again. I love coffee and I love different types of coffee including flavoured coffees. Jarrah Vienna Cinnamon Coffee is simply delicious and the cinnamon flavour is subtle rather than overpowering. 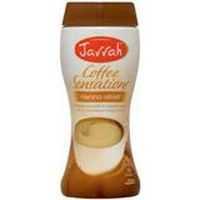 Jarrah Vienna Cinnamon coffee l use to drink with my mum a few years back and it was a good coffee that we both enjoyed,loved the cinnamon flavour! My guilt-free afternoon baby-nap-time treat... Picks me up and helps get the day finished! I keep this one, the Swiss and the French ALL in my pantry. Also, in WA, these are $4.40 each at Coles- everyday- and still between $6.50 and about $7 at Woolies, everyday!! How would you rate Jarrah Vienna Cinnamon Coffee?